An engrossing novel from a bestselling author. It is business as usual when Henrik Fenger picks up a girl in the bar and cheats on his wife with her in his hotel room. However, when he opens his eyes the very next morning, nothing is as usual anymore. Rebekka Franck is on her way to spend a lovely relaxing week of vacation with her ex-husband Peter and her daughter Julie. They are supposed to work on their relationship and find each other as a family again, but soon Rebekka is pulled away for work when she is called in to cover the case for the newspaper along with her photographer and former boyfriend, Sune Johansen. 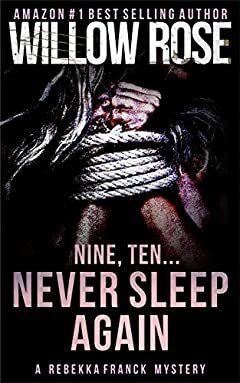 ËƒËƒËƒ Nine, Ten...Never sleep again is the fifth and last installment in Willow Rose's popular Rebekka Franck-series.